I didn’t think I was ready for the NRL to start, but I was wrong. That is an important one so I think I might repeat it. Innocent until proven guilty. I’m sure you would want the benefit of this presumption if it was you. I have a problem with society building up young men to the point of hero worship only for everyone to act mortally wounded when one of their heroes comes plunging to the ground. This stuff sells newspapers so that is important to keep in mind as well. If any of these men are found to have committed criminal offences then there will be criminal sanctions commensurate with the law, worldwide sporting sanctions, NRL sanctions and contractual sanctions from the Titans. Rugby League salaries are supply and demand related. We want to watch the game live and on TV and salaries are commensurate with our desire to watch the product. Brand and image correlate with our desire to watch the game (apparently, although sometimes I’m not so sure) and player contracts are designed to protect the brand and image of the game. The Titans will be within their rights to terminate player contracts if their players have contravened their contracts. I have an issue if their contracts are terminated prior to a criminal law conviction. Very difficult to know how they could be sure of the facts prior to a court of law considering the issue. Bringing the game into disrepute should still be subject to current criminal prosecutions. It is going to be a long time before these issues are ventilated before a court of law. Even if everything is fast tracked, I’m thinking at least the rest of this year, if not longer. I’m getting a bit jaded with this tip of the iceberg stuff. ASADA led with the darkest day in Australian Sport History and look where that ended. Two years later a number of current and ex-Cronulla players have fallen on their swords and Essendon is still fighting (verdict expected to be handed down in March 2015 at the earliest, no doubt appeal rights will be exercised producing further delays) but that is it. Will the rest of the iceberg ever appear? Anecdotally it seems that drugs are rife in society (I really don’t know where they are getting their information from but people keep saying this, so it must be true or so ‘A Current Affair’ would have us believe) so it isn’t so surprising that a group of young men with large disposable incomes have allegedly participated in procuring, supplying and possessing drugs. At the end of the day whether they like it or not these players are role models for children and the image of iconic sporting heroes getting involved in illicit drugs is not going to have a good impact on children, so there’s that. There is a personal health issue at play for these players (if the allegations are true) which must be handled as well. I can’t remember a season that hasn’t started without a massive PR disaster for Rugby League. Can’t believe the NRL just took over the Titans. Well I can believe it. It just happened. Solution – Rugby League needs to be a 12 month season. Players get into too much trouble when they stop playing. Last year’s NRL Preview was a tome. I’m talking 432,000 words and 4,200 pictures (only slightly exaggerating) but it near killed me to write it across a week so I’m breaking this one down into 4 parts. Part 1 covered teams I’ve predicted to finish in positions 13 to 16. The ‘Wishing there was a Draft but happy there’s no Relegation Teams’. Part 2 covered teams 9 to 12. The ‘Missed by that Much Teams’, a homage to Maxwell Smart. Google it if your under 35. This week, Part 3 covers teams 5 to 8. The ‘There and Thereabouts Teams’. Could get hot and make the GF like the Bulldogs last season but unlikely to win the whole thing. Part 4 will be teams 1 to 4. The Contenders. If this Team was a Movie that Movie would be – The Jungle Book – They (like Shere Khan) will hang around all season and sneak into the 8 but that will be it for 2015. This is a young team on the rise with Brooks, Moses, Tedesco, Simona, Woods, Sironen and Taupau all capable of lifting their game to the next level and providing the Tigers with the impetus to make the 8. Farah, Galloway, Halatau and Lawrence balance this with experience. Blair, Gavet, Anasta, Fulton and Murdoch-Masila will all be missed with depth in the forwards a particular challenge. Big Question – Is there enough depth in the forwards? I think not and I think this will be their downfall in the end. They have let a lot of good young forwards go in the last few years. The salary cap had a role in that but the administration must shoulder some of the blame on this one too. Andrew Fifita would have been the centrepiece of this pack if he had been retained but long range forecasting is an art and can be hit and miss for clubs. If the Tigers pack is decimated by injury then their season will go up in smoke but if they do survive the season with the pack fairly intact then they will play finals football. Top Gun – Luke Brooks – Farah is the heart and soul of this Tigers club but Brooks will take over as the best player this season. Was very assured in his first full season of First Grade although was found out in defence a lot. Given opposing coaches ran their biggest players through him this was no great surprise and to a certain extent it is up to the coach to design defensive patterns to cover for smaller players. Should be a big season for him. Young Gun – Half the team would fall into this category but I’m giving this to Mitchell Moses. Should complement Brooks, Tedesco and Farah nicely after a taste of First Grade last year. X-Factor – James Tedesco – Hit the ground running last year but had issues with injuries which hampered his progress. If he can stay injury free (and that’s a big if) will be devastating in attack and should get mentioned along with Matt Moylan and Josh Dugan for the vacant NSW SOO Fullback jersey. The Big Leap – Aaron Woods – Woods has been a standout in the Andrew Fifita mould for the last couple of seasons but will really make the leap this year. There is a theory floating around that props take a few years to really season into First Grade and Woods is no exception to this rule. Consistency is the key and I think this season he will find it, in spades. Losses – Braith Anasta (retired), Blake Austin (Canberra Raiders), Adam Blair (Brisbane Broncos), Jarred Farlow (French rugby), Liam Fulton (retired), James Gavet (Brisbane Broncos), Jy Hitchcox (Featherstone Rovers), Marika Koroibete (Melbourne Storm), Ben Murdoch-Masila (Penrith Panthers), Cory Paterson (Salford Red Devils), Bodene Thompson (New Zealand Warriors) and Andrew Vela (QLD Cup). Starting Team – 1. James Tedesco, 2. David Nofoaluma, 3. Chris Lawrence, 4. Tim Simona, 5. Pat Richards, 6. Mitchell Moses, 7. Luke Brooks, 8. Aaron Woods, 9. Robbie Farah (c), 10. Keith Galloway, 11. Curtis Sironen, 12. Sitaleki Akauola, 13. Dene Halatau. Interchange – 14. Martin Taupau, 15. Ava Seumanufagai, 16. Sauaso Sue, 17. Matthew Lodge. Squad – Nathan Brown, Jack Buchanan, Manaia Cherrington, Josh Drinkwater, Andy Fiagatusa, Asipeli Fine, Salesi Funaki, Dallas Graham, Delouise Hoeter, Lamar Liolevave, Kyle Lovett, Joel Luani, Nathan Milone, Tim Moltzen, Kevin Naiqama, Chance Peni, Kurtis Rowe and Brenden Santi. If this Team was a Movie that Movie would be – The Maze Runner – Another post-apocalyptic movie. The Warriors will continue to be compared to post-apocalyptic movies until they convert their not insignificant potential into a premiership. I chose this movie particularly because the Warriors are a riddle wrapped in an enigma, surrounded by a conundrum. Just like a box of chocolates, you never know what you are going to get. This team could finish anywhere but I’m guessing they will streak their way into the Finals this year. Johnson and Tomkins are the key in terms of attack and if their attitude is spot on, the forwards should lay a sufficient platform. As always, where the Warriors are concerned, consistency will be the key. Hoffman will help and Mannering has been helping for years. Top Gun – Shaun Johnson – Australian journalists were quite disparaging of Johnson being awarded the Golden Boot (probably because they rate Origin and the NRL above all else) but he deserved the award given his whole body of work (especially the Four Nations) and considering it is impossible for him to shine on the Origin stage. He will benefit from the presence of Sam Tomkins even more this year. If his forwards give him a consistent platform to work off he will be even better. Young Gun – Solomone Kata – They are calling him the Beast 2.0 and he is coming soon to a theatre near you. His 9s and pre-season form seem to have won him the starting centre spot beside Konrad Hurrell. I don’t think anyone is looking forward to marking him. I can’t see a place for him in the team but I wonder whether Brad Abbey will force his way in sooner rather than later as well. X-Factor – Sam Tomkins – Tomkins had a nice debut season which built as the year went on. Shaun Johnson has some X-Factor but so does this man. He will be more assured in his second season in the NRL. Expect him to be near the top of the leading try scorers list. The Big Leap – Konrad Hurrell – This man is a wrecking ball. It is season number 4 for Hurrell. I think this will be his best year yet. Plenty of kisses to Mum as well. Starting Team – 1. Sam Tomkins, 2. Tuimoala Lolohea, 3. Solomone Kata, 4. Konrad Hurrell, 5. Manu Vatuvei, 6. Chad Townsend, 7. Shaun Johnson, 8. Jacob Lillyman, 9. Thomas Leuluai, 10. Ben Matulino, 11. Ryan Hoffman, 12. Simon Mannering (c), 13. Bodene Thompson. Interchange – 14. Suaia Matagi, 15. Sam Rapira, 16. Ben Henry, 17. Nathan Friend. Squad – Bradley Abbey, Matthew Allwood, David Bhana, Raymond Faitala-Mariner, Charlie Gubb, Siliva Havili, Sebastine Ikahihifo, Ngani Laumape, Sam Lisone, Sione Lousi, Ken Maumalo, John Palavi, Nathaniel Peteru, Api Pewhairangi, Dominique Peyroux, Albert Vete and Jonathan Wright. If this Team was a Movie that Movie would be – Turner and Hooch – They will be in the mix until the final series without the big finish. I think they overachieved last year. They were in 7th spot when the season ended and made it to the Grand Final on the weak side of the draw which just seemed to open up for them. Having said that, they had an astute off season. 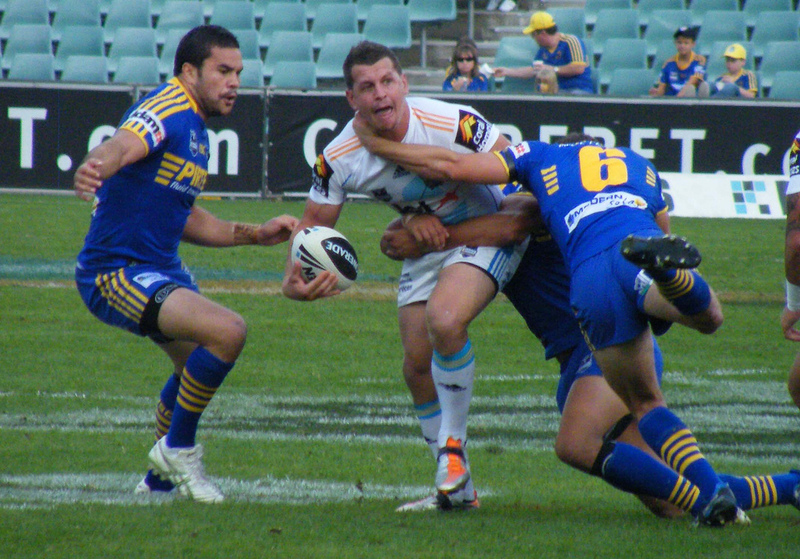 Brett Morris was an inspired move as was Michael Lichaa. He is the real deal. Why can’t they go better than last year then? I just like 5 other sides better than them. Reynolds, Hodkinson and Graham played out of their skin during the Final series and I’m just not convinced they can get hot during the Finals again this year. Big Question – Can Josh Reynolds and Trent Hodkinson continue their upward trend? They are both scrappy and competitive at the same time and continue to surpass expectations. They compliment each other perfectly. Reynolds has the odd brain explosion which is the downside of being so competitive. The game against the Broncos in Brisbane springs to mind. He lost his composure completely. If both of them can continue to develop, particularly if they can unlock this back line then the Bulldogs will exceed my expectations. Top Gun – James Graham – Not many players are the best forward and the best ball player in their team at the same time. James Graham is a rare one indeed. Has had some infamous moments in the NRL mainly involving his head but is starting to be known for his skill as well as his toughness and go forward. If he maintains his 2014 form across the 2015 season the Bulldogs will remain amongst the competition heavyweights. Has an uncanny resemblance to Ed Sheeran as well. Young Gun – Michael Lichaa – I’m giving this to Lichaa because he is only 21 and also because he spent a lot of time out of the picture because of Cronulla’s response to his signing with the Dogs. Forced his way back into the side by the end of the year but still only played a handful of matches. X-Factor – Sam Kasiano – Holding on to my Kasiano shares though I’m starting to wonder about him. Has had his fair share of injuries after bursting on to the scene. Also seems to be out of condition most of the time. When Canterbury have Kasiano and Graham playing like ball playing forwards they are a different team and almost impossible to stop. The Big Leap – Michael Lichaa – I think he is that good that they will be talking rep jerseys already for him. The NSW team has Farah, Gidley and Ennis in the picture but all are ageing. Laurie Daley will be starting to look around for a successor to Farah and Lichaa wouldn’t look out of place. Starting Team – 1. Brett Morris, 2. Corey Thompson, 3. Josh Morris, 4. Tim Lafai, 5. Sam Perrett, 6. Josh Reynolds, 7. Trent Hodkinson, 8. Aiden Tolman, 9. Michael Lichaa, 10. James Graham, 11. Tony Williams, 12. Josh Jackson, 13. Greg Eastwood. Interchange – 14. Tim Browne, 15. David Klemmer, 16. Frank Pritchard, 17. Sam Kasiano. Squad – Adam Elliott, Damien Cook, Antonio Kaufisi, Jacob Loko, Moses Mbye, Jarrod McInally, Lloyd Perrett, Curtis Rona and Chase Staley. If this Team was a Movie that Movie would be – Terminator 2 – They just keep on rebooting. I used to think this about Melbourne but too much time has passed for the Storm. The Sea Eagles have managed to continue to move on. Most of their decisions have been terribly unpopular but give them credit, they’ve made the tough choices. Club favourites Glenn Stewart and Anthony Watmough are big, big losses. Both are at the tale end of their careers though (Stewart (31) and Watmough (31)) and have begun to suffer regular injuries. Manly obviously felt they weren’t going to get value for money. They’ve picked up some underrated replacements in Luke Burgess (large body to bash through the middle), the rejuvenated Willie Mason and the mercurial Feleti Mateo (a poor man’s Glenn Stewart at half the price). At the end of the day DCE, Kieran Foran, Brett Stewart and Matt Ballin are one of the best spines in the game. The other thing people are forgetting is how much Manly missed Matt Ballin during the final series. Big Question – Where are the forwards? I think I just answered this question. They will miss Watmough, King and Stewart but Burgess, Mason, Mateo and Horo should help. Manly always do enough to win. They have a little bit of depth, especially in the backrow but not heaps. Injuries could expose them but injuries will expose any team. Top Gun – DCE – Kieran Foran is awesome but he will always be Robin to DCEs Batman. Really don’t know which way DCE will go for his next contract and his recruitment threatens to disrupt the team (as will Foran’s) but Manly have weathered worse. Really thought the Titans were a chance until they went completely off the rails. DCE will continue to improve this year and he is already a great player. Will continue to serve his apprenticeship for the QLD team as well. Young Gun – Peta Hiku – Still only 22 I’m going to give this to Hiku. He found a regular position for himself at both club and international level last season and 2015 will be much the same. Was tempted to give this to either Tom or Jake Trbojevic but I think Tom is a year away at this stage and Jake is recovering from some nasty injuries and will probably need a season to return to full strength. X-Factor – Brett Stewart – Repeatedly hampered by injuries in the last few seasons, this could be his year again. Plays very similarly to Billy Slater and is almost impossible to stop in broken play. The Big Leap – Feleti Mateo – Big expectations have always followed Feleti Mateo. During his early years in Parramatta he showed game changing ability but also showed a penchant for inconsistency. This continued with the Warriors but expectations were again always high. I don’t think this will be the case with Manly and I think he will thrive as a result. Starting Team – 1. Brett Stewart, 2. Peta Hiku, 3. Jamie Lyon (c), 4. Steve Matai, 5. Cheyse Blair, 6. Kieran Foran, 7. Daly Cherry-Evans, 8. Willie Mason, 9. Matt Ballin, 10. Brenton Lawrence, 11. Justin Horo, 12. Feleti Mateo, 13. Jamie Buhrer. Interchange – 14. Tom Symonds, 15. Josh Starling, 16. Jesse Sene-Lefao, 17. Dunamis Lui. Squad – Tyson Andrews, Delroy Berryman, Luke Burgess, Michael Chee-Kam, Clinton Gutherson, James Hasson, Jayden Hodges, Blake Leary, Manaia Rudolph, Ligi Sao, Tony Satini, Jake Trbojevic, Siosaia Vave, Brayden Wiliame and David Williams. Cricket World Cup. Still awesome. I haven’t analysed this statistically but I think the Associates are doing better than ever. Will cover this in more detail in a few weeks but I think including them in a tournament like this is vital. Am not liking the proposed reduction of teams for the next World Cup. Perhaps they should condense the preliminary rounds but I think reducing the participants is not the answer. World Club Series. Although it was 3-0 to Australia, I loved the World Club Series. Warrington should have beaten the Dragons and Wigan v Broncos could have gone either way. Souths were too big, too fast and too strong for St Helens but I think the concept is one worth persevering with. I heard rumblings about UAE or Florida hosting the event. That could be an option. Those of you who have read some of my posts will know I have a thing for advanced metrics. I thought of another statistic during the World Club Series I want David Middleton to measure. Points off errors. Warrington gave up a few of these. Another Khurram Khan Airline worker story as predicted. This isn’t rocket science but it is still funny. Massadio Haidara (Newcastle) for Andre Wisdom (West Brom) – Just trying to get more players on the field really. Forster (Southampton), Clyne (Southampton), Haidara (Newcastle), Terry (Chelsea), Sanchez (Arsenal), Eriksen (Spurs), Downing (West Ham), Hazard (Chelsea), Cazorla (Arsenal), Kane (Spurs) and Ings (Burnley) with Hamer (Leicester), Austin (QPR), Wasilewski (Leicester) and Ivanovic (Chelsea) on the bench. I think I have 7 players on the field this weekend. Curse you Matchday 27. I’m pretty sure everyone will be in the same boat.